If you want to enjoy some of the local nightlife, and mix with the artistic crowd and celebrities, then you should head to Hozenji Yokocho. 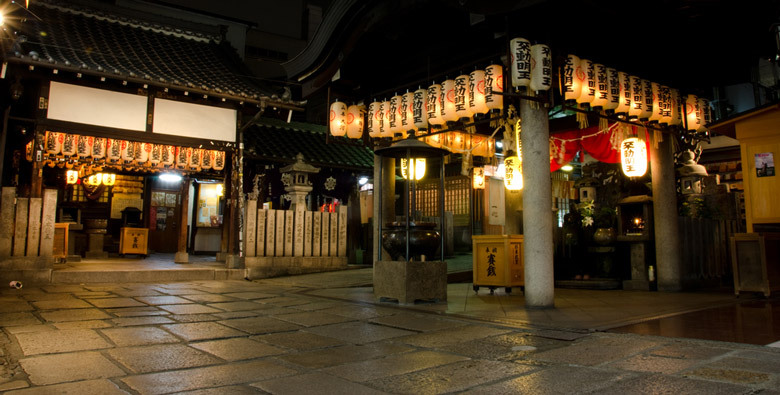 This alley is located behind Hozenji Temple and has been a place of entertainment since the 17th century and today experiencing its nightlife is one of the top things to do in Osaka. You’ll never get bored on a night out in this alley; it’s filled with sixty bars and restaurants that have a quirky and intimate feel. The areas popularity with actors and artists stems back to its origins when its location was in the center of Osaka’s theater district. One of the most memorable sights you’ll see on a visit to Hozenji Yokocho is the statue of the kami Fudomyoo. The statue is deliberately scary in appearance as its intended that Fudomyoo will scare passers-by into enlightenment. Over the years local people have poured water over the head of the statue for purification. This has led to the entire statue being covered in moss; it’s quite a spectacular sight. Abeno Harukas, the tallest building in the Abeno district. Abeno Harukas is a modern, urban multi-use building in Osaka. It’s a massive structure; the tallest in Japan, measuring 984 feet. As you can imagine, it’s one of the best places to get exceptional views of the city. If you’re looking for the things to do in Osaka then a trip to the Abeno Harukas observatory should certainly be high on your list. You can take a walk along the observation deck which is located on the 60th floor of the building; the top floor. You can also stop off at the 58th floor which houses an open air plaza. On both floors you can get incredible views out across the city of Osaka. It gives you a whole new perspective on the bustling streets below. Once you’ve enjoyed the views on offer you can visit the Kintetsu Department Store in the building and there’s also the opportunity to take in some culture, at the urban art museum. You’ll see important and impressive exhibits representing various areas of art, from within Japan and from western countries. After you’ve taken your time exploring everything that Abeno Harukas has to offer you can sit and take in some refreshment at one of the many onsite restaurants. 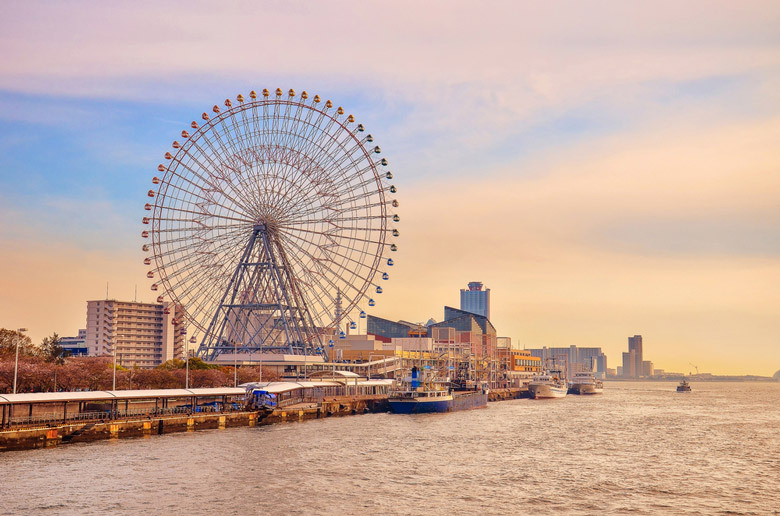 If you’re wondering what to do in Osaka then take a trip down to the mouth of Osaka Bay where you’ll find Tempozan Giant Ferris Wheel. It really does live up to its name; it’s a huge and impressive wheel that stands 112.5m (369 ft) high and has a diameter of 100m (330ft). Just jump on (after paying for your ticket, of course!) and take a ride, and you’ll get to see some eye catching sights. Since 1997 the wheel has impressing its passengers, and one revolution takes about 17 minutes. While riding on the wheel you can look down and out over the sea, across to the mountains and around at the city of Osaka. At any time of day a trip to Tempozan Ferris Wheel is an experience to remember, but if you’re traveling with your partner you can make it extra special with a visit after dark. Once the sun goes down the wheel is illuminated, and it’s beautiful. This is known for being one of the most popular dating spots in Osaka, and it’s easy to see why when it’s so romantic. 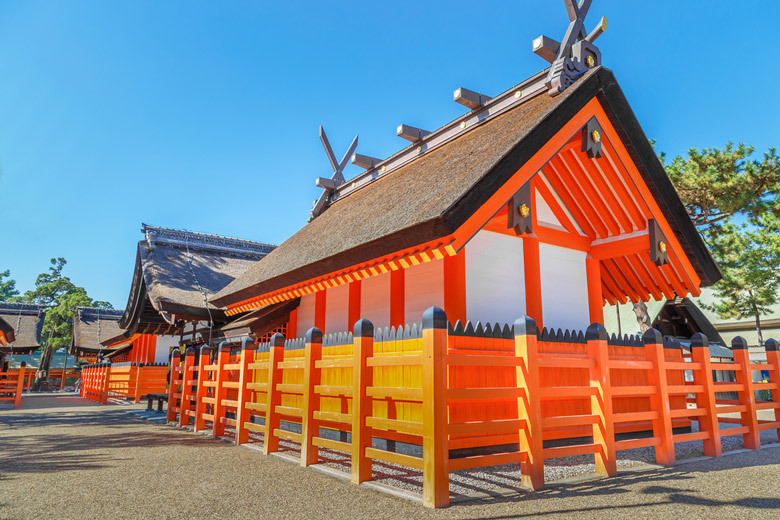 This shrine in Osaka is also known as Sumiyoshi Grand Shrine and it’s a shrine of the Shinto religion as well as being the main shrine of all the Sumiyoshi shrines in Japan. The shrine is popular with local people, especially at New Year when large crowds gather and of course it’s also popular with tourists all year round who want to learn more about this historic place of worship and the religion it serves. 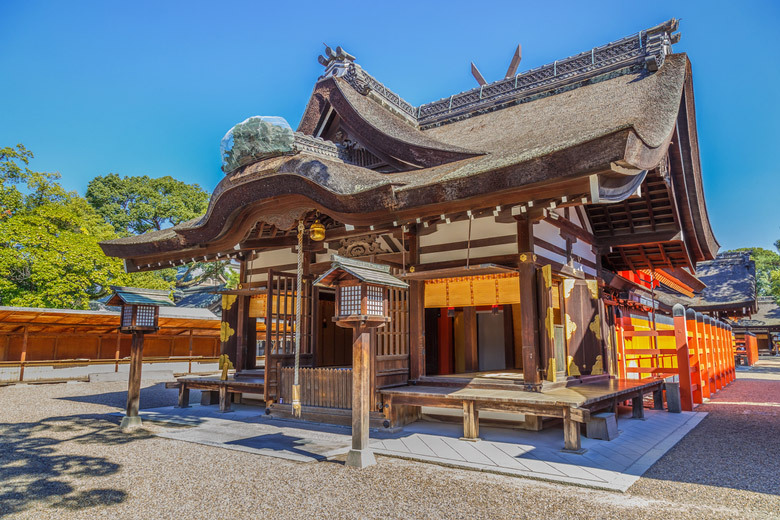 The shrine is dedicated to a number of different Shinto gods who are collectively known as the great gods of Sumiyoshi. 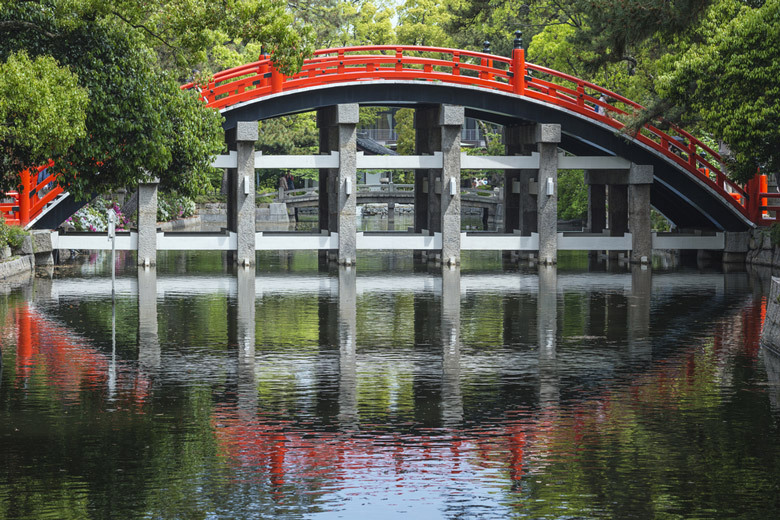 If you visit Sumiyoshi-taisha Shrine you will see examples of the Sumiyoshi-zukuri style of architecture (these are the oldest examples in existence) and this shrine is characterized by its vibrant red coloring that you’ll see on bridges and structures. 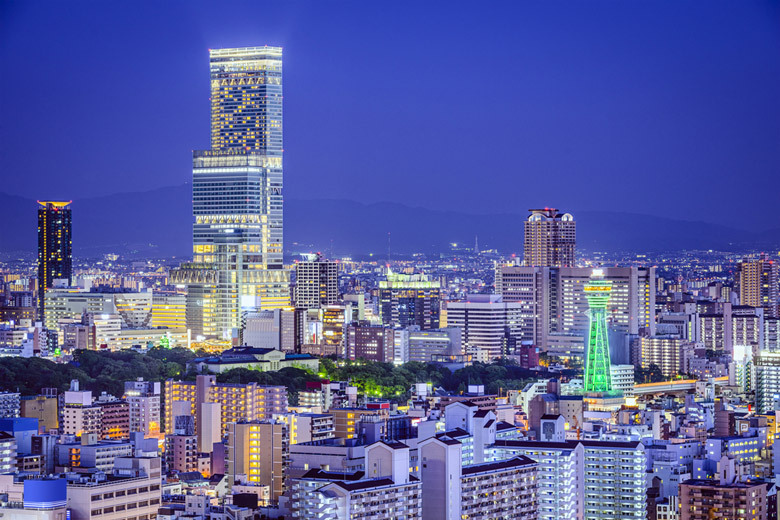 What most visitors love about this particular Osaka attraction is its peaceful atmosphere and the fact that it’s quieter than some other attractions in the city. If you’ve already spent some time shopping and dining in the city and you’re looking for other things to do in Osaka, a trip to the shrine gives you something a little different to add to your itinerary. You can visit the Japan Mint at any time of year for an interesting insight into not only the history of coinage in Japan, but also from around the world. When money is something we use everyday it’s easy to take it for granted, so a visit to the Japan Mint puts it all into perspective! 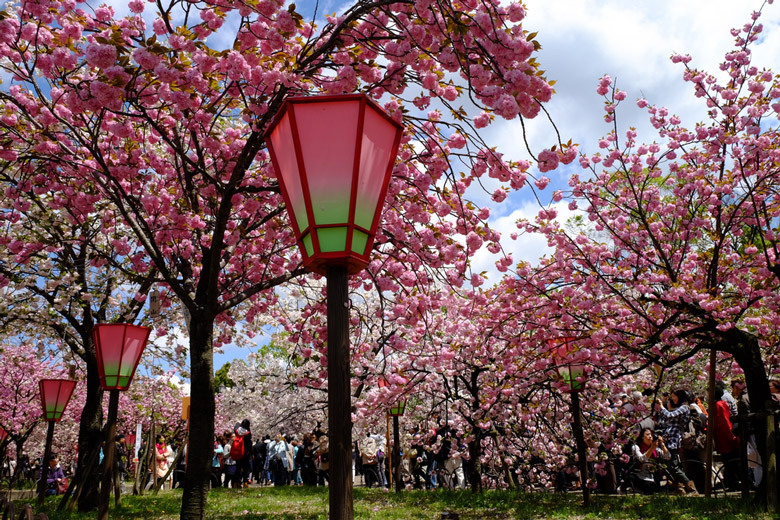 The Japan Mint isn’t most famous for its coin exhibitions but, this is also a great place to visit in the spring for its amazing display of cherry blossoms, known as one of the best in the city. For just one week in April each year the cherry blossoms are in full bloom and there are more than 300 cherry trees in the gardens of the Japan Mint; covering more than 100 different varieties. When these trees bloom the sight is spectacular; and that’s why the Japan Mint is such a popular Osaka attraction. The cherry tree gardens are only open to the public for this one week and the exact dates of the week tend to change each year because the dates of the blooming vary slightly, although they’re always around mid-April. If you want to see the cherry blossom blooming at the Japan Mint you will usually be able to find details of the opening dates on the website during the month of March. The Osaka Castle that exists today is not the one that was originally built in 1583. That castle was destroyed and its replacement, which was built in the 1620, was also destroyed by fire. 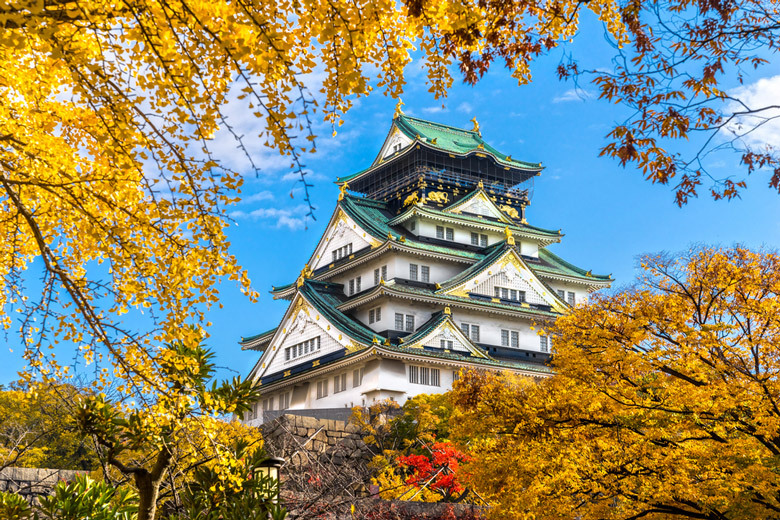 The reconstruction of the castle that you’ll see at this Osaka attraction today was completed in 1931 and despite heavy bombing in Osaka during World War II the newly built version of the castle remained intact. Osaka Castle is one of the most popular things to do in Osaka and it’s an excellent reminder of the city’s history while also being a very modern building inside. The castle even has an elevator to make access easier for visitors. A trip to the castle is a fascinating experience. You can learn all about the history of the castle in its various incarnations. If you want to step outside and see the gardens of the castle you have to pay a fee. It’s worth it though; the gardens are beautifully kept and make an excellent place to have a relaxing stroll as you enjoy your time spent in Osaka. If you want to shop ‘til you drop in Osaka then Shinsaibashi is the place to do it. It’s a huge shopping area that attracts both local people and those visiting the city. The area is a modern shopping hub but it’s developed from arcaded streets that have provided a haven for retail for hundreds of years. You’ll find every kind of shop you need in the roofed shopping arcade that just buzzes with the excitement of finding the perfect purchase and the chatter of sociable shoppers. For members of the teen generation, the American-mura Village is the place to be. This is situated in the western part of Shinsaibashi and is known for the colorful illustrations painted on its walls. Although this area is popular with youngsters it’s not actually that new. The stores have been in existence since the 1970s and sell an eclectic mix of second hand clothes, records and other goods that all originate from the west coast of the USA. This place maintains its vibe as the cool place to shop. If you visit Shinsaibashi you’ll probably get chance to walk along Mido-suji Street which is the main street in Osaka and links together several of the different districts. The street runs through the Shinsaibashi area. Who doesn’t love a theme park? This park in Osaka was the first one built by Universal Studios in Asia and first opened its doors to the public in 2001. It’s located in the area around Osaka Bay and is popular with adults and children alike. 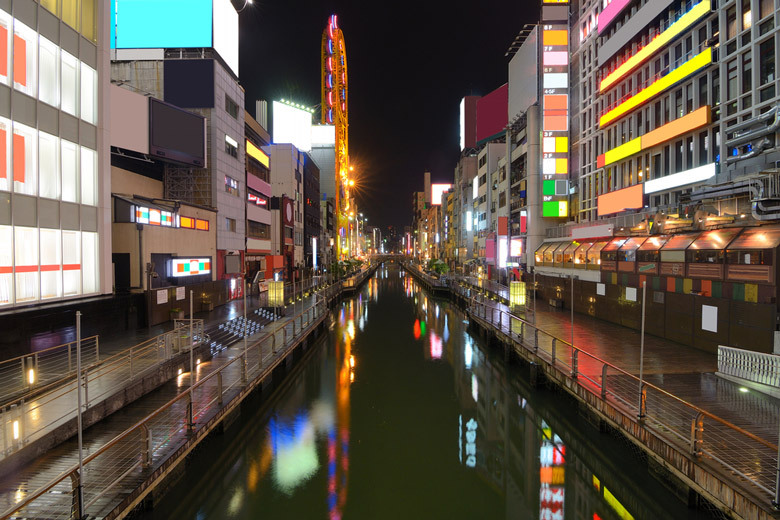 If you’re wondering what to do in Osaka, and you’re visiting with family, then you’ll have loads of fun checking out the different sections of the theme park. 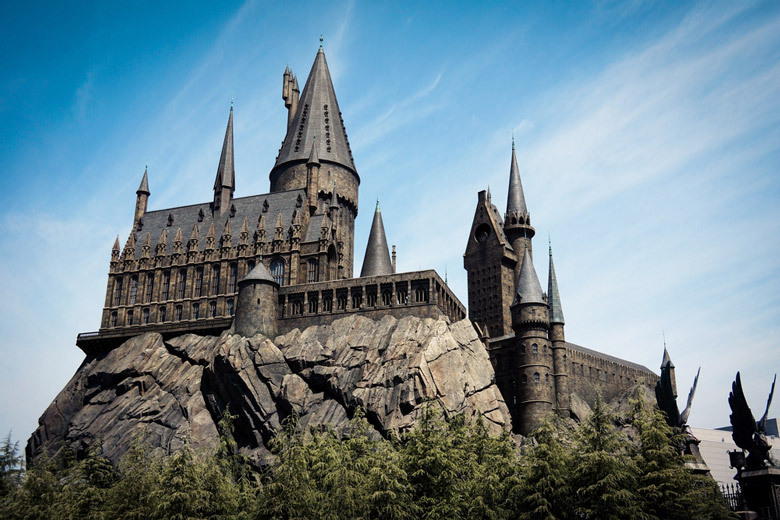 The sections include New York, Universal Wonderland and The Wizarding World of Harry Potter for fans of the magical star of page and screen. There are rides to suit all tastes and ages at Universal Studios Japan, whether you love the adrenaline rush of a rollercoaster or prefer something a little more sedate. If you have kids with you on your trip to Osaka they’ll love a day at this theme park; aside from the rides there are also plenty of chances to get a photo taken with characters such as Snoopy and Hello Kitty. You can also take in one of the many shows at the park and watch one of the regular parades. After time spent at the theme park you can visit Universal Citywalk Osaka, right outside. It’s an impressive shopping mall with dozens of restaurants and shops to choose from. 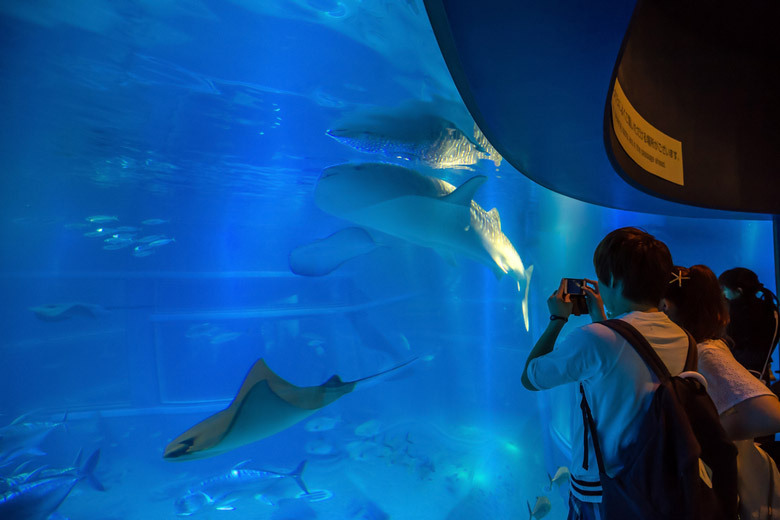 One of the most popular Osaka attractions is the Osaka Aquarium Kaiyukan, located close to Osaka Bay and the Tempozan Ferris Wheel. It’s known as one of the most impressive aquariums in Japan and features creatures that originate in the Pacific Rim area. The aquarium is a fascinating place to spend time and learn about the various creatures on display in fifteen large tanks. The different tanks represent the different parts of the Pacific Rim area and the largest tank, which represents the Pacific Ocean, is home to a whale shark. When you visit the aquarium you should not miss this exhibit which is the most popular at the venue. Any tour of the aquarium starts at the top and you make your way down, checking out the different tanks as you go. As you pass through different levels you often get to see the same tank from a different perspective. 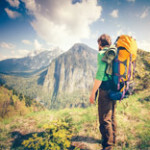 There are so many different creatures to see that every level is a completely new experience. 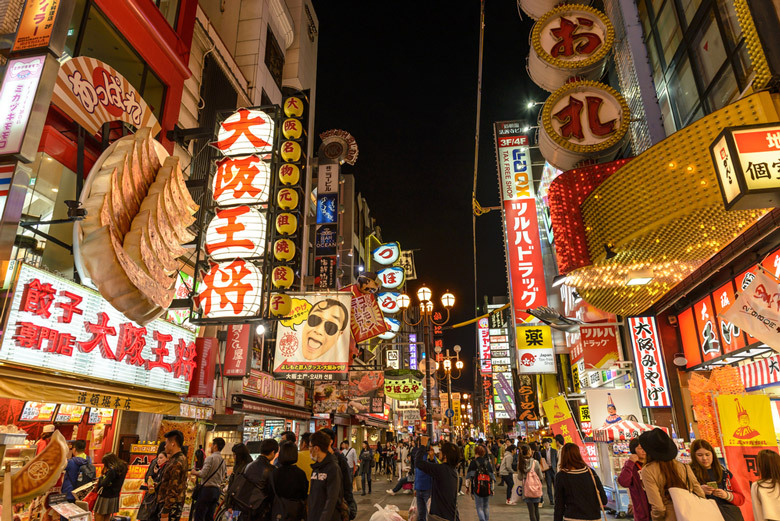 A trip to Dotonbori is a little like having a dream in neon; the area is adorned with neon signs at every angle! Despite its neon light decoration, this canal side area still retains a lot of its 17th century traditional feel so it has an interesting ambiance. 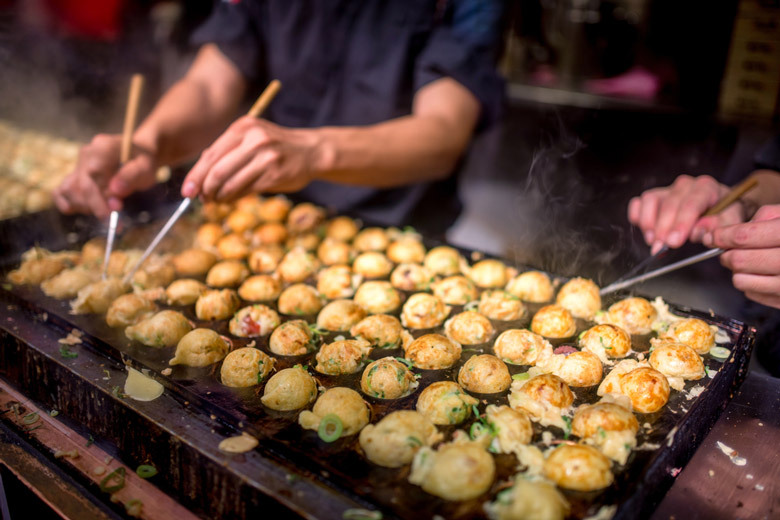 Very popular with the people of Osaka, Dotonburi is a vibrant place to visit with its collection of restaurants serving delicious local dishes and fun amusements to keep you entertained. When visiting this top Osaka attraction you may get the chance to see Bunraku, a traditional puppet show, or visit a storytellers’ hall. This is all very traditional entertainment, in a modern day environment. 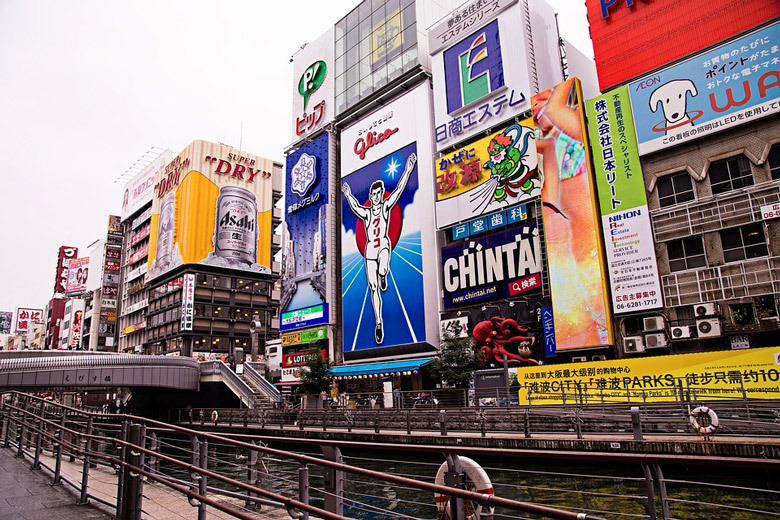 If Dotonbori seems familiar to you it’s probably because you’ve seen it on the big screen; it often features when Osaka is represented in the movies. Its bright array of advertisements and neon signs are quite iconic. In a departure from the vibrant atmosphere the Hozenji Temple is also in this area. This interesting temple is a representation of the history of Osaka. Visit the temple then check out Hozenji Yokocho Lane which lies in front of the temple. Here the quaint shops serve as a reminder of what the area was like in the 17th century. It’s a more tranquil part of Dotonbori, and a beautiful one.